To the classical historian, both temples and celery come to mind when one thinks of Selinunte, the ancient Selinus of the Greeks. The temples are fairly obvious, the celery less so. Yet the English and Italian words for the stalky vegetable derive from sedanus, which in turn comes to us from selinon (there was also a mythical king named ‘Selinus’), and indeed celery grew wild around Selinus, particularly along the river of that name. The site of this important Siceliot (Sicilian-Greek) city of antiquity bears the ruins of an acropolis and numerous temples, though much of what is standing today was reconstructed from pieces found in the vicinity. (Please activate your JAVA to use this link.) The city was founded in the seventh century BC (BCE), and effectively destroyed in 409 BC. The glory of ancient Selinus lasted for about two centuries, when it was one of the most progressive Greek cities in Sicily, famous throughout Magna Graecia. 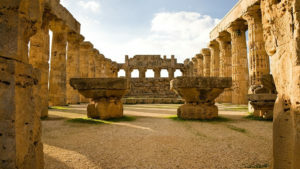 The Selinunte site is located near the southwestern coast of Sicily in the province of Trapani. While Akragas (Agrigento) boasts more standing Greek temples in its “Valley of the Temples,” Selinunte is set in a much more tranquil setting. The city of Selinunte proper, known as the “acropolis,” is situated on high ground overlooking the Mediterranean about twenty meters below. The acropolis is located roughly in the center of the large archeological park. Founded by Doric Greek colonists from Sicily’s Megara Hyblea between 650 and 630 BC, Selinus is mentioned by Diodorus Siculus and Thucydides, and while neither historian is noted for being especially accurate, most of their observations about Selinus appear to be correct. Often embroiled in border battles with the Elymians living in Segesta and Entella, the inhabitants of Selinus constructed an efficient port. However, a treaty of sorts was eventually reached over their common border and the skirmishing ceased around 580 BC, ushering in a period of peace lasting a century. It was commerce and the resulting wealth that permitted the residents to develop Selinus and erect the splendid temples. Selinunte’s trade, riches and elegant buildings soon made it famous as one of the most important cities of Greek Italy, second in importance only to Syracuse. However, Selinunte’s success soon earned it the envy of the Carthaginians who controlled pockets of western Sicily. This eventually led to the city’s demise. The citizens of Selinus remained neutral in the war of 480 BC, not siding with their fellow Greeks when Agrigento and Syracuse decisively defeated the Carthaginians at Himera. Such neutrality on the part of Selinus hardly earned the city any Greek friends, and while this policy was intended to appease the nearby Carthaginians, that, too, turned out to be a mistaken impression. Soon enough, by 409 BC, the political situation had changed. In the intervening years, Selinunte’s diplomats had managed to establish an alliance with Syracuse and Agrigento. This ensured Selinunte seven decades of peace and prosperity, during which some of the more beautiful and sophisticated temples were built. However, the Carthaginians still sought power in Sicily. Selinunte became involved in the war between Syracuse and Athens, and in 409 the Greek city-state sent an expedition to punish the Sicilian cities that sided against her on with Syracuse. Never able to capture Syracuse, the Athenians left Sicily having incurred heavy losses. Thus Selinunte’s diplomacy managed to avoid her involvement in the war. Most of Sicily’s other Greek cities, however, were worse off, with their armies weak and disorganized. Among these were Agrigento and Syracuse, Selinunte’s allies. This opened an opportunity for the Carthaginians. The Greeks simply spent too much time fighting each other. The Carthaginians used the pretext of some minor border skirmishes between Selinunte and the Elymian-Greeks of Segesta as an excuse to march upon Selinunte to aid their old allies. They sent an army (estimated by some at 100,000 men) equipped with battering rams and siege towers that were taller than Selinunte’s walls. Selinunte appealed to Agrigento for aid, but this proved to be in vain. Following this, the site of the city remained an abandoned ruin for centuries, through the Roman period and into the early medieval era. Around 700 AD, a small Byzantine Greek village grew up around the ancient ruins. However, a serious earthquake destroyed that village and further damaged what was left of Selinunte early in the ninth century, just prior to the arrival of the Arabs in Sicily. The site’s temples are identified by letter. Some of the famed “metopes,” stone-carved panels depicting various scenes from Greek mythology, currently on display in Palermo’s regional archeological museum, came from Temple E.
Temple F is located right next to Temple E, built circa 550 BC. This temple may have been dedicated to the bacchanalian deity, Dionysos. It may have also contained the temple treasury, as there are signs that the spaces between the columns were enclosed. Temple G, the last and largest of the trio, was larger. It is thought to have been built around 530 BC, but was never completed. This large temple was the fourth largest Greek temple ever built, not only in Sicily but in all the Greek world. Unfortunately, only one large column is still standing. The rest of Temple G is a great pile of large stones. The actual city of Selinus, the acropolis, is located west of the “eastern temples,” built on high ground looking toward the sea. It was once flanked by two small rivers, one on each side of the city. The walls surrounding the acropolis were reconstructed under the direction of archaeologists in 1927, though a few segments have stood since antiquity. Ancient sources gave the city a population of over twenty thousand, a figure supported by the size of the acropolis. Within the acropolis are the foundations of five temples, of which only Temple C is in discernible condition. As you follow the road leading west of the acropolis, you cross the Modione River (the ancient “Selinus”), arriving at the western end buildings on the hills. The principal structure here is the “Sanctuary of Demeter Malophoros” (the fruit bearer), a large enclosure. Inside are the ruins of several shrines where worshipers placed stone figurines whose purpose was to honor or appease the gods. Many of these “stellae” have been recovered and placed in museums, and a number are displayed in Palermo. The sanctuary is thought to date from the 6th century BC. Next to it is the Sanctuary of Zeus.